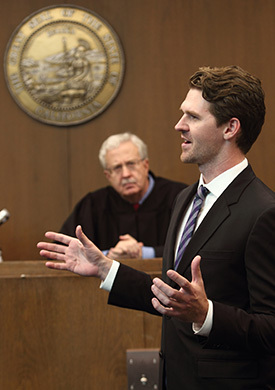 The USC Gould School of Law provides a forward-looking, interdisciplinary and inter-professional legal education guided by nationally renowned professors and energized by an engaged and collegial student body. As one of the most diverse of the nation's top law schools, USC Gould is made up of students from throughout the country and around the world whose ideas and experiences enrich the learning process and provide new perspectives on the law. Through close collaboration, interdisciplinary academic training and hands-on application of skills, students acquire the experiences and knowledge necessary to succeed as leaders in a global environment. USC Gould alumni are partners in the world's largest law firms, CEOs and presidents of multimillion-dollar companies, and leaders in government and public service organizations. Since its founding in 1900, the school has produced hundreds of judges on state and federal courts and elected officials ranging from mayor of cities large and small to a United States senator. The Juris Doctor (JD) is the basic law degree. To obtain the degree, full-time attendance for six semesters is required. During the first year, the student takes a curriculum of basic courses that examine fundamental legal institutions and address legal problems relevant to today's society and the modern practice of law. During the second and third years the student must complete a writing requirement and at least six units in experiential courses. The remainder of the courses taken in the last two years are primarily elective. USC Gould maintains dual degree programs with the graduate programs in accounting, business administration, economics, gerontology, pharmacy, philosophy, public administration, public policy, social work, politics and international relations, real estate development and communication. These programs enable qualified students to earn a law degree (JD) and the appropriate master's degree. If the master's degree normally requires one year of study, a student in a dual degree program earns both degrees in only three years. If the master's normally requires two years of post-baccalaureate courses, a total of four years is required. To earn the JD, all students (including dual degree students) must complete 35 numerically graded law units at USC beyond the first year curriculum. The goal of these programs is to encourage law students to gain a recognized competence in another discipline that has a direct relevance to the roles lawyers play in society. The dual degree programs are based on the premise that some topics covered in the law school are also covered in the programs of the cooperating departments, so that some credit toward the law degree may appropriately be given for specified graduate work taken in the cooperating department. Similarly, the cooperating departments have recognized that some credit toward the master's degree may appropriately be awarded for certain work completed in the law school. The residential Master of Laws (LLM) program is a master's degree program for foreign graduate students trained in law. This two-semester, full-time program introduces foreign lawyers to American law and the U.S. legal system and prepares them for leadership roles in the global market. After successfully completing the program, students will be awarded the Master of Laws degree. The online LLM program is a master's degree program for foreign graduate students trained in law. This program is offered on a part-time or full-time basis in an online modality and introduces foreign lawyers to American law and the U.S. legal system and prepares them for leadership roles in the global market. After successfully completing the program, students will be awarded the Master of Laws degree. The Master of Laws in Alternative Dispute Resolution (LLM in ADR) program is a master's degree program for law graduates and attorneys interested in building strength as advocates in ADR processes or gaining skills and a prestigious credential for pursuing career opportunities as mediators or arbitrators. In addition to building valuable negotiation, mediation and arbitration skills as an advocate for a client or as a neutral, students develop a deep understanding of underlying policies and legal ramifications for a full range of ADR options. The Master of Comparative Law (MCL) program is a master's degree program for foreign graduate students trained in law who have already earned an LLM degree. This two-semester, full-time program is focused on the study of comparative law. Students are provided with the opportunity to study the differences, similarities and interrelationships of different systems of law around the world. After successfully completing the program, students will be awarded the Master of Comparative Law degree. The online Master of Studies in Law (MSL) program is designed for new graduates as well as seasoned professionals from varying fields of studies and careers, who seek an understanding of how the U.S. legal system functions. The MSL degree gives non-lawyers an expertise in legal issues related to their specific professional fields and academic interests. After successfully completing the program, students will be awarded the Master of Studies in Law degree. The Master of Dispute Resolution (MDR) program is a master's degree program for graduates from varying fields of study who are interested in building strength as advocates in alternative dispute resolution processes. In addition to building valuable negotiation, mediation and arbitration skills as an advocate for a client or as a neutral, students develop and hone business management skills to optimally position yourself for leadership roles in alternative dispute resolution organizations. Order of the Coif: Order of the Coif is a national honorary scholastic society that encourages excellence in legal education. Qualifications: Membership will be extended to a graduating law student whose cumulative grade point average ranks in the top 10 percent of all graduating students, provided that he or she has completed at least 75 percent (66 units) of law studies in graded courses. Applications: Students are nominated by the law school. USC Gould is a national leader in continuing education, presenting six annual programs designed for sophisticated attendees from the bar, judiciary, accounting, business, and law student communities and supported by both law firm and corporate sponsors. USC Gould has been approved as a provider of Minimum Continuing Legal Education (CLE) credit by the State Bar of California and offers general CLE and Legal Specialization Credit for lawyers, as well as continuing education credits for accountants, real estate professionals, and certified financial planners. CLE programs in 2017–2018 include the Institute on Entertainment Law and Business, Trust and Estate Conference, Tax Institute, Institute for Corporate Counsel, Real Estate Law and Business Forum, and Intellectual Property Institute. For detailed program and registration information, visit gould.usc.edu/cle. For additional questions, call (213) 821-3580 or email cle@law.usc.edu. Students in the law school's JD program pay tuition of $61,898 per year (two semesters) (26–34 units). For less than 13 units the tuition is $2,393 per unit, and tuition is an additional $2,393 for each unit over 17. Students in the law school's residential LLM and MCL programs pay tuition of $61,898 per year (two semesters). Students in the law school's online LLM program pay tuition on a per unit basis. In addition to the mandatory fees charged to all USC students, law students must also join the Student Bar Association. In 2015–2016, this membership fee was $25 per semester. First-year students must have earned a bachelor's degree from a regionally accredited college or university and be able to provide an official transcript denoting the degree conferred by the beginning of their law school classes. USC Gould does not require applicants to take any specific college courses, and discourages pre-law students from enrolling in college courses that duplicate the law school curriculum. The faculty recommends college courses that are intellectually challenging and require disciplined study. Training in careful reading and skilled writing is most valuable, as are courses involving seminar discussion and sustained research. The student will find that a broad exposure to such fields as economics, philosophy, history, political science, anthropology, mathematics and psychology is more useful than narrow exposure to vocationally oriented courses. All applicants are required to take the Law School Admission Test (LSAT) administered by the Law School Admissions Council (LSAC). Applicants must take the test no later than February if they seek to start law school the following August. Like most law schools, the USC Gould School of Law requires students to apply online through the LSAC and register for the Credential Assembly Service (CAS). The CAS assembles an applicant's transcripts, LSAT scores and letters of recommendation and forwards copies of them to law schools of the applicant's choosing. Further information about the LSAT and the CAS may be obtained from the Law School Admission Council, 662 Penn St., Box 40, Newtown, PA 18940 and online at lsac.org. Detailed information regarding admission application procedures is available from the Dean of Admissions, University of Southern California Gould School of Law, University Park, Los Angeles, CA 90089-0074 and on the school's Website (gould.usc.edu). The program is open only to USC undergraduate students who can complete their required bachelor's major course work by the end of their junior year (or only have minimal units of upper division elective courses remaining). Admitted students complete their undergraduate and law school studies in a total of six years. After year one of law school (at the latest), students must have all necessary course work completed to earn their bachelor's degree and after year three, their law degree. However, the preference is that the bachelor's degree requirements be completed prior to beginning law school course work. Students are not required to take the LSAT for admittance. Students must have a minimum cumulative undergraduate GPA of 3.80 both at the time an application is submitted and at enrollment. Additionally, strong faculty letters of recommendation, a personal statement, and an interview are required components of the application. The program is open to all participating majors. A student in good standing at a law school that is approved by the American Bar Association may apply for admission with advanced standing either as a transfer student or as a visiting student. Transfer students enter USC Gould after one year at another law school; they then spend two years at the law school and earn the JD degree from USC. Visiting students spend one or two semesters at the law school during their third year of law school; they are not eligible for a USC degree. For further information, please request Transfer/Visitor Information from the Admissions Office at USC Gould. USC Gould also admits a small number of highly qualified transfer students with LLM degrees from an American Bar Association accredited law school. These students will have taken a large number of JD courses in their LLM course of study and received strong grades in those courses. For further information, please contact the Graduate & International Programs Office at USC Gould. USC Gould School of Law offers an LLM to JD Transfer Program to non-U.S. law school graduates who have received an LLM degree from an ABA-accredited law school. USC Gould School of Law students enrolled in our LLM Program may apply to our JD Program as Transfer LLM students during the transfer application period in the spring semester. In addition, current LLM students of other ABA-accredited law schools may submit applications during the spring semester. Only a limited number of outstanding students from USC Gould and other ABA-accredited law schools will be offered admission each year. For further information, request LLM transfer information from the Graduate and International Programs Office at USC Gould. Students submitting an application must have earned a basic law degree, a Bachelor of Laws (LLB) degree or the foreign equivalent. Some experience following the completion of the first professional degree is preferred. For further information, contact the law school at (213) 821-5916 or visit the school's Website (gould.usc.edu). Students submitting an application must have earned a basic law degree, a Bachelor of Laws (LLB), a Juris Doctor (JD), or the foreign equivalent. Some experience following the completion of the first professional degree is preferred. For further information, contact the law school at (213) 821-5916 or visit the law school's Website (gould.usc.edu). Students submitting an application must have earned a basic law degree, a Bachelor of Laws (LLB) degree or the foreign equivalent and will have previously earned their LLM degree. Some experience following the completion of the first professional degree is preferred. For further information, contact the law school at (213) 821-5916 or visit the school's Website (gould.usc.edu). Students submitting an application must have earned an undergraduate degree in some field of study by the time they begin the Online MSL degree. Prior exposure to or experience in law is not required. For further information, contact the law school at (213) 821-5916 or visit the school's Website (gould.usc.edu). Students submitting an application must have earned an undergraduate degree in some field of study by the time they begin the MDR program. Prior exposure to or experience in law is not required. For further information, contact the law school at (213) 821-5916 or visit the law school's Website (gould.usc.edu). Registration is handled by the USC Gould School of Law Office of the Registrar. First-year students will automatically be registered in their fall semester courses approximately two to three weeks prior to the beginning of the school year and for their spring semester courses during the week listed in the law school calendar for upper-division student registration. The grading system uses both numbers and letters in a range from 1.9 to 4.4 with letter-grade equivalents ranging from F to A+. The grade equivalents are: A+ (4.1–4.4); A (3.8–4.0); A- (3.5–3.7); B+ (3.3–3.4); B (3.0–3.2); B- (2.7–2.9); C+ (2.5–2.6); C (2.4); C- (2.1–2.3); D (2.0); and F (1.9). Students receiving a grade of 1.9 will not be given credit for the course toward graduation. A student who fails a first-year course must repeat the course, but both grades will be included in computing that student's general average. Other courses may not be repeated except on petition to the associate dean. A student with a weighted cumulative average of less than 3.0 at the end of the year will be placed on restricted enrollment. A Juris Doctor student with a weighted cumulative average of less than 2.7 at the end of any year will not be permitted to continue. An overall grade point average of at least 2.6 is required for graduation with graduate students who are enrolled in the LLM, LLM in ADR, MCL, MDR or MSL, Alternative Dispute Resolution Certificate, Business Law Certificate (online), Compliance Certificate (online), and Entertainment Law and Industry Certificate (online) programs. After the first year, a student may take up to a total of 8 units on an elected CR/D/F basis, chosen from among courses otherwise graded in a normal manner. No more than 4 such units may be taken in a semester. The student must elect to take a course CR/D/F during the first two weeks of the semester. Courses or seminars may, at the instructor's option, be designated prior to registration as not available for CR/D/F grading. To earn the JD, all students (including dual degree students) must complete 35 numerically graded law units at USC beyond the first year curriculum. Students may be accepted for a dual degree program when they are accepted to the law school, although most students do not apply until near the end of the first year. All programs require that students successfully complete the required first year of law school before beginning work toward the master's degree. Credit toward the law degree may not be given for graduate work completed prior to the completion of the first year of law school, although some credit toward the master's degree may be allowed by the faculty of the cooperating department of approved work completed prior to the first year of law school. Students are not eligible for either of their dual degrees until they complete the requirements for both degrees. All students (including dual degree students) must complete at least 35 numerically graded USC Gould units beyond the first year curriculum. Following are general descriptions of the dual degree programs. Students interested in further information should consult the USC Gould Admissions Office. In addition to the LSAT, applicants to this dual degree program are required to take the Graduate Management Aptitude Test. Requirements for the dual degree program are listed here and in the USC Marshall School of Business section of this catalogue. The Leventhal School of Accounting offers a specialized program in taxation leading to the Master in Business Taxation (MBT). Requirements for this dual degree program are listed here and in the USC Leventhal School of Accounting section of this catalogue. Students are required to complete 97 units of course work. Candidates for the dual degree must fulfill the statistics requirement of the MPA degree. See the Master of Public Administration section. Requirements for this dual degree program are listed here and in the USC Price School of Public Policy section of this catalogue. The USC Price School of Public Policy and the law school offer a dual degree that enables qualified students to earn both a Juris Doctor and a Master of Public Policy in approximately four years of study. Students interested in combining an expertise in another discipline with the law degree may arrange individually to take approved graduate courses for limited credit toward the law degree. Students may receive up to 12 units for graduate work taken outside the law school with the prior permission of the administration. These units may be concentrated in a single appropriate discipline; they may not, however, be applied to another graduate degree in progress unless it is a certificate program offered by another department. USC Gould offers five study abroad programs for JD students that provide opportunities to learn about foreign legal systems and to experience different cultures. Qualified second- and third-year JD candidates are exposed to international law as they take part in exchange programs with leading partner institutions worldwide. University of Hong Kong: The semester exchange program at the University of Hong Kong (HKU) allows USC Gould JD students to experience Hong Kong and its legal culture and business in the Pacific Rim. HKU was established in 1911 and is a leading university in Asia. It is linked with over 80 partner institutions in 15 countries and has exchange programs with prominent universities worldwide. The language of teaching at HKU for its law courses is English. Bocconi University: USC Gould JD students have the opportunity to learn about law and business in Milan, Italy, in this semester exchange program with Bocconi University. An Italian course is available to interested exchange students who wish to study the language before the law program begins. Bocconi University, a private institution in Milan, Italy, has a global reputation as a research university in business, economics and law. Bocconi offers its exchange students law courses in English. These include courses in international and European law, international trade law, and comparative business and corporate law. University Jean Moulin Lyon 3: The semester abroad program at the University Jean Moulin Lyon 3 allows USC Gould JD students the chance to study in English at a leading law school in Lyon, France. After earning the JD degree, graduates may elect to return to Lyon for a semester to complete an LLM in international and European law. The University Jean Moulin Lyon 3 is a public university ranked among the top in France. Lyon 3 is one of three universities in Lyon with a combined population of 100,000 students. Lyon is the second-largest city in France with a great selection of cultural and professional opportunities. Bond University: USC Gould JD students have the opportunity to live in Queensland, on the Gold Coast of Australia, for a semester while studying at Bond University. Bond University has a distinctly global perspective, aspiring to a 50:50 ratio of Australian to international students, who come from 80 countries worldwide. Under the guidance of Australia's most eminent legal professionals, internationally renowned criminologists and specialists, students benefit from the mentoring relationship fostered at Bond where professors take an active role in charting student success. Fundação Getulio Vargas University: The semester exchange with Direito GV, the law school of FGV, allows JD students to study at their campus in São Paulo, Brazil. Direito GV has one of the top law faculties in Brazil. They offer law courses in English for their exchange students. Fundação Getulio Vargas has developed a highly innovative curriculum. The Brazilian Ministry of Education and Culture and the Brazilian Bar Association have granted FGV their highest classification of academic rigor. This exchange introduces JD students to the Brazilian legal system and promotes a broad debate on the issues of global relevance within a South American perspective. USC Gould's graduate degree programs include an LLM program, an online LLM program and an MCL program for foreign law graduates. USC Gould also offers an LLM in ADR program for domestic or international law graduates, plus an online MSL program and an MDR program, both of which do not require a law background. Through the graduate degree programs, students have opportunities to meet and interact with faculty and JD students and also with practicing lawyers from around the world. The LLM, online LLM and MCL programs are intended for individuals who are trained in law abroad and wish to gain a basic knowledge of U.S. law and our legal system and/or who wish to engage in comparative legal study. The LLM in ADR and MDR programs are designed for students who wish to learn alternative dispute resolution skills and the functions of alternative dispute resolution organizations. The online MSL program is designed for new graduates as well as seasoned professionals from varying fields of studies and careers, who seek an understanding of how the U.S. legal system functions. This interdisciplinary program consists of nine courses chosen from philosophy, political science, law and anthropology courses. See Philosophy for degree requirements. The minor in law and public policy draws upon four fields of study: public policy and management, law, economics and political science. It provides students with an understanding of the political and economic contexts in which laws are made, as well as how legal institutions shape policy formulation. Students learn to analyze the consequences of policy and alternatives; the roles played by government, business and nonprofit organizations in public decision-making; and the legal bases for various areas of public policy. See USC Price School of Public Policy for requirements. This interdisciplinary program focuses on the effect of law on society and the way in which social forces influence the legal system. The idea is that students will understand the law if they look beyond "law in books" to "law in action." See Political Science for requirements. This interdisciplinary minor brings together courses in psychology that focus on the social, ethical, cognitive and societal aspects of psychology and how it relates to law. This knowledge is augmented with law courses that identify the relationship between mental health, social psychology and law. See Psychology for requirements.